Can you substitute beeswax for a vegan alternative such as candellia or caranuba? Hi guys, I have have come up with my own recipe that uses Coconut oil, olive oil, castor oil, cocoa butter, avocado oil and 3.5% beeswax. But I wanted to also add honey and some pollen, as well as BB’s honey and oatmeal fragrance oil (as it is a honey themed soap) Do you think using both honey and beeswax will make the soap heat up too much. I was planning to chuck it in the freeze straight away like I do milk soap to prevent overheating. But I am a little nervous about it as I don’t want to waste a whole batch of soap. I know I might have to try it to find out, but I am just interested in your thoughts? Also, that soap sounds lovely! Oatmeal Milk and Honey is such a warm, comforting scent. I love it! Thanks for you advice. I made a small trial batch and it turned out well. I was really nervous about it. When I make a large batch I will put an instagram picture up and # tag bramble berry. Also, I’m sorry to hear about the volcano! I’ve seen one before, it’s an interesting sight for sure. I think you’re correct – the combination of beeswax and sugar can definitely heat up quite a bit. It is a great learning experience though! I add beeswax to most of my soaps at 1% of the oils, which really helps them pop out of the individual molds (I also add sodium lactate and sometimes 1% stearic acid). While it takes high temperatures to get the wax melted, it does not clump when it cools to warm, and the oils stay clear and liquid (usually a combination of coconut, tallow/palm, olive, cocoa butter, hemp, soy and castor). Basically, I soap as usual, with no problems (I don’t measure my temps; if the lye water and oil containers feel “lukewarm”, I mix). Beeswax appears to be about 8% of your recipe. Have you tried letting the oils cool a bit? Does the wax start to harden? Also curious about the cocoa powder. Does it make for brown bubbles? Is it exfoliating? Or does it stay smooth? Just curious! 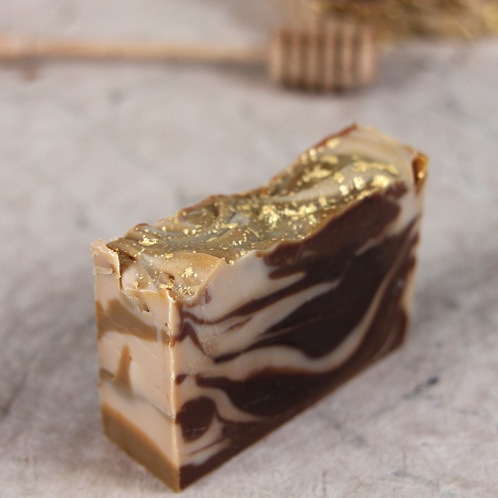 I love the shine of this soap, and would like to try a batch with a higher percentage of beeswax. That sounds like an awesome recipe! In our tests and recipes, we’ve found cooler temperatures make that beeswax harden up on us. Soaping around 160F or higher has given us the best results, but everybody’s preferences are a bit different! Thanks for the information on a new colorant! Looking forward to trying the recipe. Can I substitute anything for the hazelnut oil? I don’t have anything on hand. Thanks! I’m still calling this a win, and think in spite of it, the recipe did work. The soap looks pretty nice and smells divine. Thanks again for being there!! I just made this recipe today – it seemed fast and easy. Ha! Ha! Then I turned my back on my 3 lb mold to put the leftovers and scraps in some little molds. When I went back to my loaf, it had started volcano-ing in the center. I immediately put it in the freezer – it was on a roll and kept going for a while, but finally stopped. I was able to “tap” it hard numerous times and it all settled back down. I’m keeping it in the freezer, but it’s now got a bit of a crater down the middle and two cracks lengthwise. I was glad I was able to save it (so far!!). I was definitely surprised. The only change I made to the recipe was using Chipotle Caramel FO instead of Black Cherry, but I don’t really think that’s the culprit…It was Murphy’s Law, as I thought it was so easy-peasy!! Ha!! Question: Can I line my mold with bubble wrap to get a bee hive design on the soap? Or will soaping at these high temps (160-170 degrees) be too hot and melt the bubble wrap? 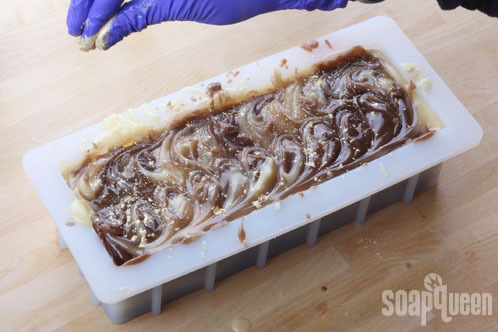 I recall seeing a tutorial using bubble wrap and heavy mica on it, which transferred to the soap and gave it a really nice look (used both on the top & bottom of the soap), but I have looked everywhere and can not find the instructions…other than in SQ M&P tutorials. Good question. It sounds like you are wanting to do something similar to this blog post! I am also new at soaping, and looking at different recipes you have on your website.I like the way this one looks and will add it to my Recipe List. I have all the ingredients except for the beeswax. Do you have to use beeswax or can you omit it? 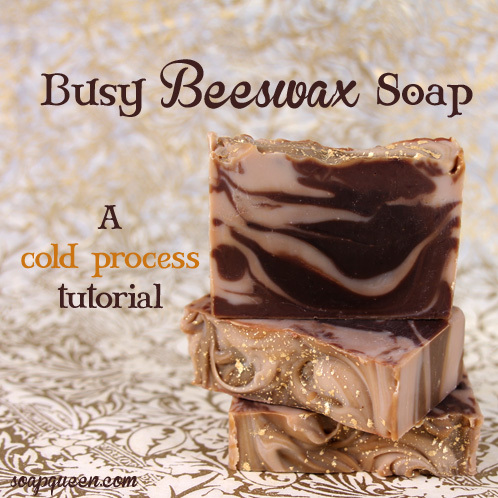 We added Beeswax to this recipe in order to give it a nice sheen. Because of the beeswax addition, it is considered a more advanced recipe. If you are new to soaping, I would give a different recipe a try first. 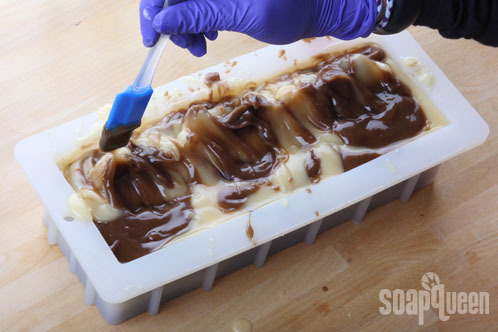 Unfortunately you cannot simply remove the wax without effecting how your soap will set up. If you’re looking for a few easier cold process recipes, I would recommend these! 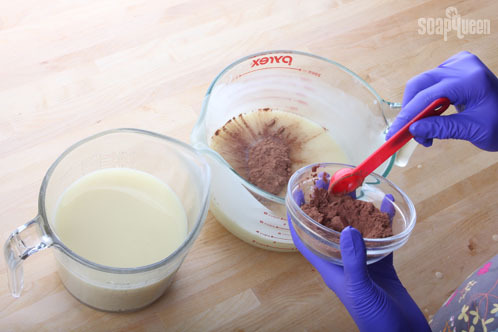 Both of these recipes features the Lots of Lather Quick Mix, which is a premade oil combination that will give you a bar with plenty of bubbles and a rich lather! That way you don’t have to worry about combining your oils…that step is already done for you! Just wondering if the beeswax makes this bar harder, aka easier to get out of the mold? I make a triple butter soap, with no sodium lactate it unmolds like a dream after 24 hours. Also great on the skin!! Going to try this soon, tho, looks great! I just did my first batch of this soap. I noticed as soon as I added my lye mixture to my oils it was cooling too fast. That lead to my layers being too big to rush things along. It was like stiff gravy when I got to the final layer. I’m not sure how to correct the problem. I watched my lye temp. It maxed out at 174. Can you help? I’m on a mission to get this soap perfected. Made this soap last week. I’m a newbie to soaping and to on this challenge. Only four batches under my belt. Read the step by step instruction numerous times, then took the plunge. They came out great! Congrats on making this soap! We’d love to hear more about your soaping adventures and if you have a chance to take some photos, we’d love to see how your soaps look. You can share them with us Bramble Berry’s Facebook page. 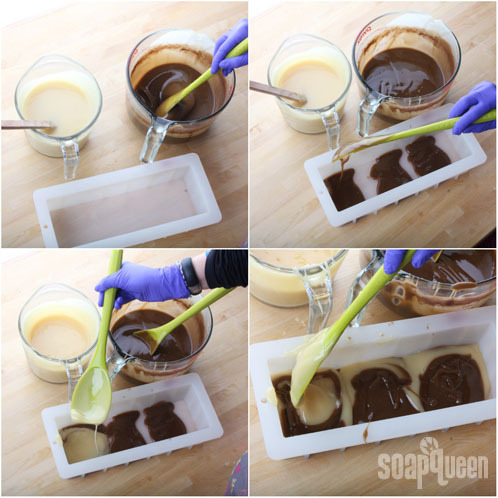 I’m fairly new to soaping and I’d love to try this recipe but I do not have the hazelnut oil on hand. Is there another oil I can use instead? If you do not have the Hazelnut Oil on hand, you can use another fixed oil like Jojoba or a little extra Sweet Almond Oil. Be sure to run your recipe through the lye calculator again to make sure you have the correct lye water amounts. Thanks Becky! This is very helpful. Can we mix Lye solution into oil and bee wax melted at 170 degrees ? Should Lye and oils with bee wax be the same temperature degrees when we mix them ? Great tutorial! Is there any reason why to wait 4-7 days before unmolding? If unmolded earlier -will it be partially gelled? 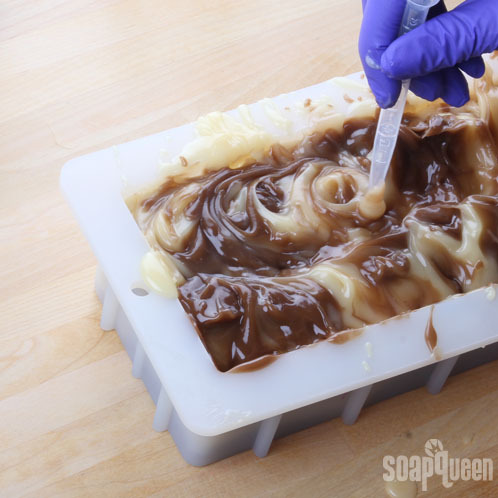 It’s the nature of silicone molds to not want to let the soap go very quickly. It’s not a matter of whether or not it will gel (that is a temperature thing) but rather the tight vacuum seal that is created by the silicone. 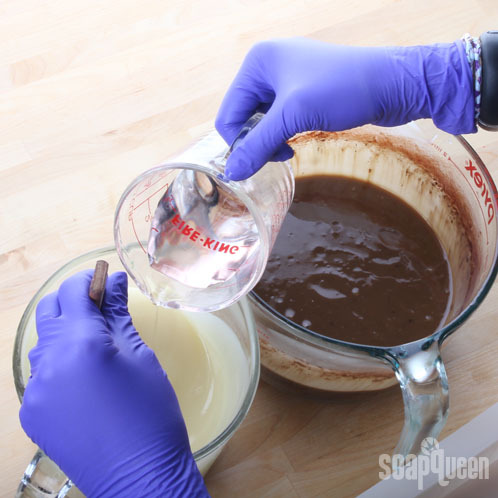 If you attempt to unmold early, you risk the soap still being quite soft and sticky, thus sticking to the inside of the mold and not creating that shiny finish that silicone is known for. However, there is a bit of a cheat code: Sodium Lactate! 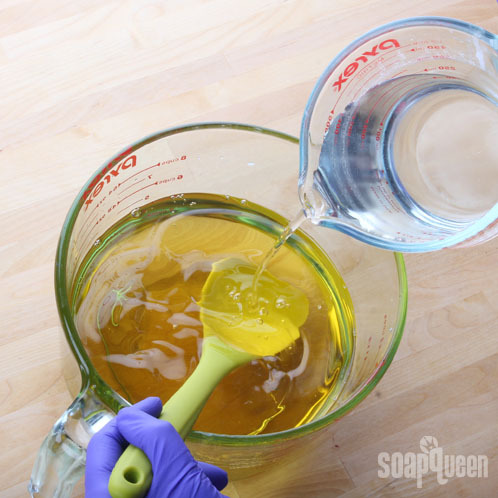 Add 1 teaspoon Sodium Lactate per pound of oils to cooled lye water, and this tends to help your soap ready itself for unmolding faster. Does the scent of the yellow beeswax survive the soaping or does it dissipate? Yay! We’d love to see some pics if you get the chance to visit our Facebook page. It’s just as inspirational to see how creative the blog’s readers are! At what temperature is your lye water when you add it to the 170 degree oils? I’ve always been advised to have the two within 10 degrees of each other. Do you have some other scent combos that would work well? I’m assuming that the scent of the beeswax will come through the soaping, or does that dissipate? Thank for the great toutorial!